Development History of the Tankpac™ AE Tank Floor Corrosion Test. Physical Acoustics Limited, Over, Cambridge, CB4 5QE, UK. The floor of an above ground storage tank (AST) is impossible to inspect using conventional methods with the tank still in-service. However, the cost of removing it from service is exceedingly high as a result of the cleaning and decontamination costs. Spending this money, and finding the floor does not require any repairs, is very wasteful of valuable maintenance resources, but the consequences of a major floor failure by stretching inspection intervals without justification are even worse. In the late 1980’s the idea of using AE to assess corrosion of tank floors was first tried at the Fawley UK refinery, resulting in the formation of a users group of more than twenty UK and Dutch companies who together developed the method into an effective on-stream assessment tool. More than five thousand tests have been carried out and the method is used worldwide as a maintenance-planning tool. TANKPAC™ uses sensitive sensors on the outside of the tank to listen to the sound resulting from corrosion of the floor. 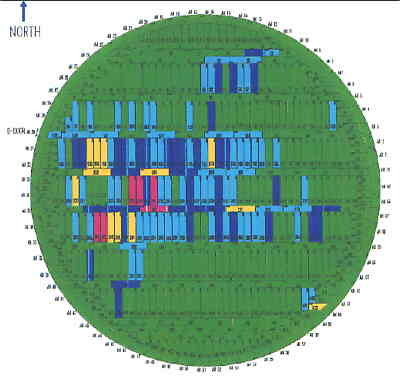 A database, developed by opening and inspecting tanks after testing, is used to interpret the data, following its separation from the environmental noise by using a range of signal analysis and processing techniques. The method provides a highly cost- effective maintenance-planning tool for tank farm managers, proven by its widespread acceptance by major oil and chemical companies. In-service, corrosion, tank floor inspection, predictive maintenance, acoustic emission. Most tank maintenance is still either time based, taking tanks out at set intervals, or "leak- based", waiting for a major problem to become apparent by the product outside the tank. "Leak-based" maintenance is no longer acceptable practice in most countries for both environmental and economic reasons. "Time-based" maintenance practice varies enormously from country to country, and company to company, however, even a strict "intelligent" time- based regime based on past history does not guarantee that no failures will occur in service, as some of the following case histories will describe. Reasons for the failure of time-based maintenance include the inadequacy of the inspection methods used, change of conditions inside the tank, leading to increased corrosion rates, and unexpected coating problems. Possibly the biggest failure of time-based maintenance though, is that enormous resources are wasted opening and cleaning tanks for inspection, when there is nothing wrong, and no repairs are needed. Saudi Aramco  reported that >US$50M would be saved annually by avoiding the tank cleaning and inspections on tanks where no repairs were actually required. Exploratory excavation was carried out; this confirmed more than 50% loss of metal under the annular ring around most of the circumference. The tank level was immediately reduced, and the tank removed from service for repair within days, before a major failure could occur. When acoustic methods were first used to investigate tank floors, in the early 80’s, the focus was on leak detection and location, and results varied enormously, with acoustics being considered, on balance, largely an unreliable method. There are several reasons why acoustic leak detection alone is of limited use for tank floors. The main one is that the sludge and debris on the floor of a typical crude oil tank is often all that seals the floor, so detecting “no leak present” tells you nothing about the floor condition. In the words of one tank farm manager: “I don’t need a complex test to tell me I’m knee-deep in oil”. What he needed was “a method to tell the condition of the floor so that inspection and maintenance can be planned before leaks occur”. By the time the floor of a crude tank gets in very bad condition it may be too late to remove the tank from service without major leakage problems. There are many cases of floors leaking in dramatic fashion when attempts are made to re-suspend the sludge prior to shutdown. 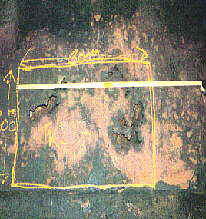 The example in Figure 3 above, shows one of 40+ holes in the floor of an “E” grade crude oil tank, following cleaning. The tank was not leaking in service, the holes were being sealed by the dense sludge and debris. On the other hand, to spend ~ $250,000 cleaning a crude tank for inspection, to find no repairs are needed, is a significant waste of valuable maintenance resources that could be better spent elsewhere. The next example occurred when operations estimated a loss of 100 cubic metres per day, but with no visible product or smell assumed it to be a gauging error. One of the eight naptha tanks had a 1cm hole due to MIC, figure 4 (right) shows the hole location found by the AE test. In this case it was impossible to assess floor corrosion as the noise from the large leak swamped the system. When the floor was cut it was found that several cubic metres of the base had been washed away by the leaking product, leading to a high risk of catastrophic floor failure. The second “leak” case is shown in fig. 5 (right), and is typical of many clean product tanks, it is a diesel oil tank and has an epoxy paint coated floor, the coating had failed locally, resulting in highly localised corrosion at a high rate. In this case one of the locations had pin-holed through into a hole resulting in product leakage. When the tank was opened shortly after, the hole was no more than 1mm diameter. In this case no problems with the tank were expected, the damage had been identified during a routine TANKPAC™ test to check for floor corrosion. There are hundreds more cases that demonstrate the limitations of conventional maintenance practices as applied to storage tanks, many refineries have tested >100 tanks in a single campaign and totally re-ordered their maintenance schedule as a result. However there are many tens of thousands more cases where tanks have been opened, cleaned, and inspected, only to find the floor to be in good condition, and no repairs are required to be carried out. This is not only an enormous waste of valuable maintenance resources, but also an environmental issue, due to the problems and costs associated with the disposal of the toxic waste. Physical Acoustics has provided “on-line” monitoring services for spheres, bullets, and similar pressure systems for 20+ years, in the 80’s a number of companies were promoting AE (acoustic emission) for tank floor leak detection. In 1989 UK customers were asking what could be done with tank floors, prior to, them leaking. We knew from work carried out in the early 80’s that rusting of steel produces substantial acoustic emission, but was it detectable on a tank floor from the outside? Transmission through the floor plate was out of the question, so it had to be via the liquid. At the time people were trying to detect leaks using acoustic systems, so the obvious answer was to try it. A small number of tanks (~50) owned by various customers were monitored and inspected afterwards during the first 2 years and a “user group” was formed to share the information. The basic procedure for testing and evaluation was established, and has slowly been refined over the years as a wider range of tank types have been tested, and more experience and feedback has been gained. New users usually evaluate the TANKPAC™ system by testing a small number of tanks and inspecting afterwards, and “user group” customers almost always feed back what they find when tanks are shut down, so the database and experience is continually expanding. The procedures are complex when compared with most AE tests, and not all tanks can be tested, or are suitable for this procedure, so very strict quality records are kept and all test results and records are reviewed by a second engineer, and approved by a PAC Level III TANKPAC™ specialist. The investment in TANKPAC™ is substantial, but the third party publications and widespread use attest to the benefits and overall reliability of the method. The basis of the method is that active corrosion produces acoustic emission, as the corrosion scale thickens the energy released from scale fracture and de-bonding or de-lamination increases. This was confirmed in the laboratory by independent research . The energy released can be substantial, but usually the signals are small, and detecting them in the middle of a tank requires very high sensitivity, good test conditions, and excellent noise recognition and rejection. The analysis of test data is split into interpretation, where all noise signals are identified and removed, and evaluation, where the information from corrosion is graded based on the amount of emission, its characteristics, and location, together with tank information such as size, product, and sludge height. Noise sources include roof movement, condensation, leakage of valves, particle impacts, nitrogen blankets, and level measurement systems. Figure 6 shows emission detected from corrosion of mild steel during one hour monitoring of a sulphur tank , the horisontal axis is signal amplitude, the vertical is number of emissions, and the depth axis is time. Fig 6: Number of emissions versus amplitude from a corroding sulphur tank during one hour. Extensive training of engineers is essential due to the complexity of the test, and before being allowed to test unsupervised they must meet minimum experience requirements and pass both written and practical examinations. "Noise" sources may also result from items corroding other than the floor, Figure 7 shows the emission located from an oilfield production tank that has many internal zinc sacrificial anodes. When the epoxy paint protection on the floor fails, the zinc anode in that area corrodes instead of the floor, which would otherwise pinhole rapidly through. This method of protection only works because of the high water content. Once the anodes have dissolved the floor will deteriorate rapidly. The "active" zinc anodes can clearly be seen. Fig 7: Emission located due to corrosion of internal sacrificial anodes in a field production tank. This 67m diameter crude oil tank, Fig. 8, showed extensive damage indications near the annular in two main areas. Following shutdown a complete magnetic flux floor scan was carried out and the results confirmed the findings. The floor had a 3mm grp coating which was still intact and tightly bonded, so the floor was cut and underside corrosion confirmed in excess of 60% through- floor. Fig 8: Emission located from underside corrosion through a 3mm grp liner in a 67 metre tank. In this next case, underside corrosion from a 110 metre diameter, grp lined, crude oil tank, unusually for this type of grp coated tank, activity was not from the annular, but from the middle of the floor. Following opening, the MFL survey, (magnetic flux leakage, shown in Fig. 9), confirmed the findings, the floor coating was intact, so the floor was cut, to reveal severe underside corrosion. An analysis of the sand base showed chlorides to be present, leading to the suspicion that a truck load of beach sand had been used during the building operation. Fig 9: MFL survey confirming TANKPAC™ AE results from a 110m grp lined crude tank, off-centre areas represent >60% underside metal loss. Usually a grp coating in crude service gives good long-term protection, however, on one occasion, out of seven identical crude tanks at the same location, six graded "A", no indication of any problem, and one graded "E", indicating severe corrosion damage, location analysis indicated the entire floor to be corroding. The tank was removed from service to find the grp coating was loose and floating around in the product, inadequate surface preparation or poor resin cure was suspected. The TANKPAC™ test gives information on the amount and location of different types of emission, together with grades that result from processing the data based on the database of experience with particular tanks and products. The data is normalised before grading, it must be remembered that the location plots show only a percentage of the data, that which reaches three sensors, and this will vary with tank condition and test situation. The grading system takes into account all the factors that may have an effect on the test result. There are two main parameters, which make the “composite grade”, first the “overall” grade, and then the “potential leak” grade, a combination of these results in the “composite” grade. The re-test interval or inspection recommendation, is from the user group experience, this is shown in table 1 below. The similarities between this and an RBI (risk based inspection) matrix are obvious, and the Tischuk T-Rex-T advanced RBI package uses the Tankpac™ results in the risk and planning assessment process. It should be clearly stated that "potential leak" or "PLD" data does not imply the tank is actually leaking, only that there is highly concentrated activity of a type that historically has been associated with severe localised corrosion. When a significant leak is present, it is clear, and this may mask corrosion activity, preventing grading of the tank corrosion damage, similarly, identification of minor leaks may be masked by highly active corrosion. This comparison focussed only on the "overall" tank grade and concluded that 100% of "A" grade tanks had no damage and required no repair, whereas 60% of "E" grade tanks had extensive damage requiring major repairs or a new floor. Fig. 10 shows the correlation between overall TANKPAC™ grade and the subsequent repairs required. One point made was that if the "PLD" data is taken into consideration the "misses" (B grade with FU3-4) are reduced. False calls (D/E with FU1-2) result from failure to recognise extraneous noise, increased experience, improved test practice, better operator training, and modern analytical methods have reduced these still further. Fig 10: Correlation between "Overall" TANKPAC™ grade and the Extent of damage and repairs required following internal inspection. Data from 157 tanks internally inspected, from 600 tests carried out prior to June 1996. As more experience is gained on different tanks and products, in different conditions, and inspection feedback increases from customers, the procedure has been "fine-tuned", with the annual update now at revision 10, more than 5000 tanks have been tested on-line. One limitation is that the system depends upon the presence of corrosion scale, so any procedure that removes this chemically or mechanically will "reset" tank condition. The method also cannot assess the internal condition of tanks in which the product or conditions regularly change, as the corrosion may stop and start. It will however tell you if the corrosion is currently active or not, and dramatic results have been seen when corrosion is stopped by deliberate chemical neutralisation. The method may still be used to check for underside corrosion on tanks with product changes. A comprehensive method statement is available that clearly states the test requirements and limitations on use. A method now exists which can assess tank floor condition in-service, it is not an inspection method, but a maintenance-planning tool that allows owners to optimise the interval between tank internal inspection and re-habilitation, making enormous financial savings as a result, by avoiding unnecessary tank opening, whilst still maintaining integrity. The method has been developed in co-operation with major oil and chemical companies and has been used worldwide in over 40 countries, a total of 12 years experience exists in the field use of the technique. The ability to diagnose damage in tanks long before a failure occurs now allows operators to plan their maintenance far more effectively, avoiding failure incidents, which are both costly and damaging to the environment. TANKPAC™ is the only non-invasive on-line maintenance-planning tool available for above ground storage tanks, the cost of testing with the method is insignificant when compared with the cost of actually opening a tank for internal inspection. This brings large M$ savings to operators, and when compared to many time-based inspection regimes, improved performance, as it is effectively providing a true "condition-based" maintenance planning approach. Miller, S.D., O'Brien, J., Keck, D.L. Saudi Aramco, (1998) Proceedings of 7th European Conference For Non-Destructive Testing, Copenhagen. Van De Loo, P.J., Shell Global Solutions, (1998) Proceedings of 23rd European Working Group Conference on Acoustic Emission. Vienna. Gautrey, S.N., Cole, P.T., Physical Acoustics, (1997) Proceedings of 22nd European Working Group Conference on Acoustic Emission. Aberdeen. Van De Loo, P.J., Shell Global Solutions, Herrmann, B. Dow Stade, (1998) Proceedings of 7th European Conference on Non-Destructive Testing.